All three classes regularly access the Outdoor Classroom. 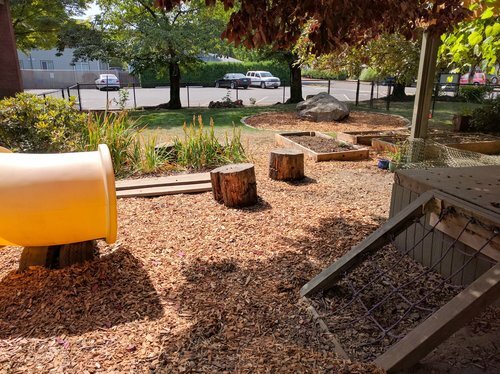 This natural space offers a variety of areas for exploration, encouraging interaction with the natural world, problem solving, cooperative and collaborative play, and the strengthening of gross motor development. Our sand area provides students the opportunity for deep exploration and creativity. During outdoor time our students can be found digging, moving, building, developing imaginative scenarios and more. The sand area includes a water spigot kids can use to learn about cause and effect, volume and spatial logic. Students also develop their fine and gross motor skills and learn how to work together. For example – an entire team of children can be found working together to dig a canal. The sand and water play is completely open-ended allowing students to design a new, complex environment every day. 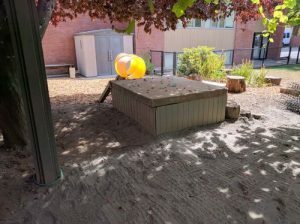 Adjacent to the sand area is a raised platform student can use as a base for building their own play structure. Children must work together to build ramps. The platform can also serve as a house or a castle or as a stage for dramatic play. Children are naturally inclined to climb. Students can also access the platform using a net ladder, which supports gross motor development. From the platform children gain a new perspective on the Outdoor Classroom and gain a sense of accomplishment. We also have climbing areas in both indoor classrooms! 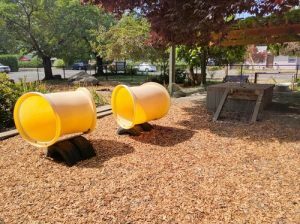 The yellow tunnels provide another chance to climb and support physical development, but also allow children to explore and discover in other ways. For example children might shout inside the tunnel simply too determine how the sound is different inside than outside. Large chimes are often placed near the tunnels – these also encourage sound exploration and creative expression. The tunnels offer children a change of perspective whether inside, on top or beside them. The tunnels also offer a space to be alone, to reflect, to observe, to be with friends, to negotiate sharing of space while practicing ways to keep your self and others safe. Planks and logs are a valuable part of our Outdoor Classroom. These loose, moveable parts support engineering concepts – children might use them to build their own play structure or balance beam. They also support social development as children must request assistance and work together to move the parts. Our school garden includes a space for each of our three classes. 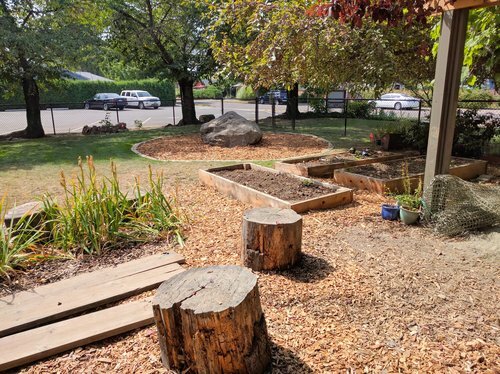 Our garden connects children with the natural world and the source of our food and provides us an opportunity to share valuable lessons about agriculture, math, science, art and health. 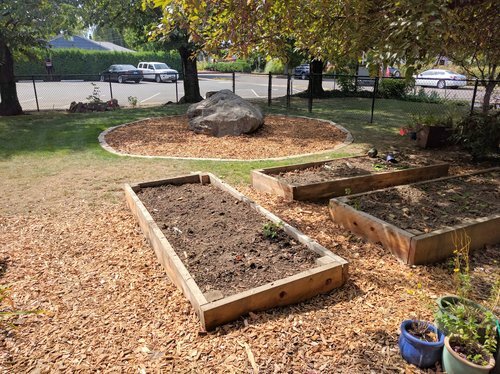 The garden is also a useful tool in educating our students about personal and social responsibility. 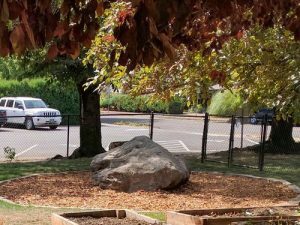 The boulder is a place to challenge and develop gross motor skills and to problem solve routes and sharing of space. It is also a place to be alone to think and observe, or a place to be with friends to chat or use imaginative play. Our children often wonder about the creatures and plant life that live in and around the boulder. Like the other climbing areas, the boulder offers the chance to explore a new perspective. Just like with the tunnels, the planks and the platform, children can use the boulder to experience risk taking, sense of accomplishment, challenge themselves to develop new skills.